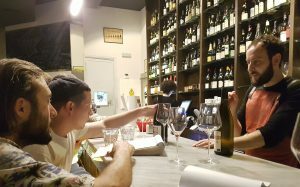 It was in the evening of the Haro Station Wine Experience. 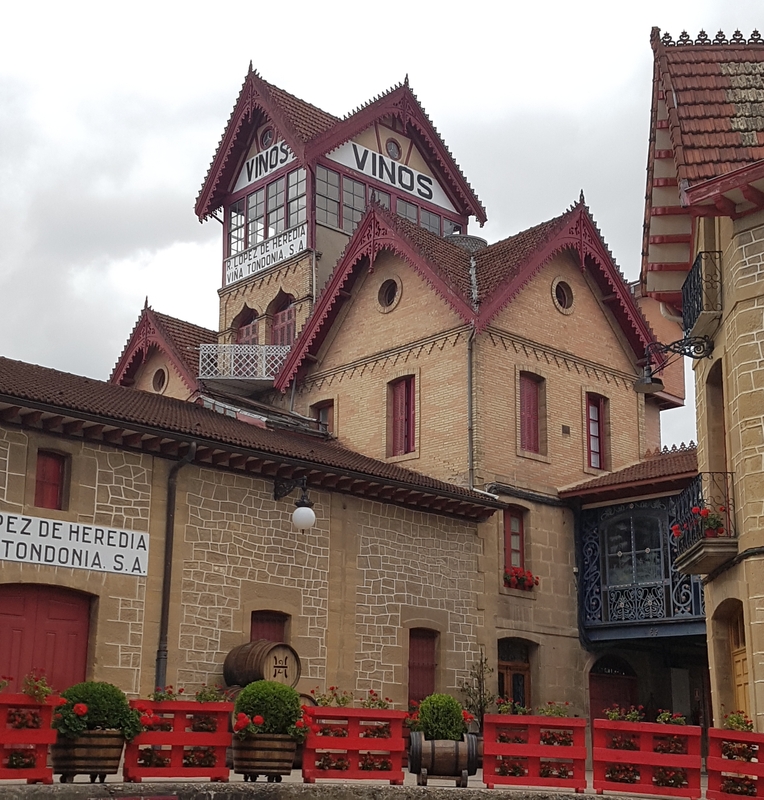 Lunch was over and I was walking around in the streets of the Barrio de la Estación, where many of the leading bodegas establish themselves after the railroad came to town and a new area started, with Rioja as a leading brand and Haro as its capital. 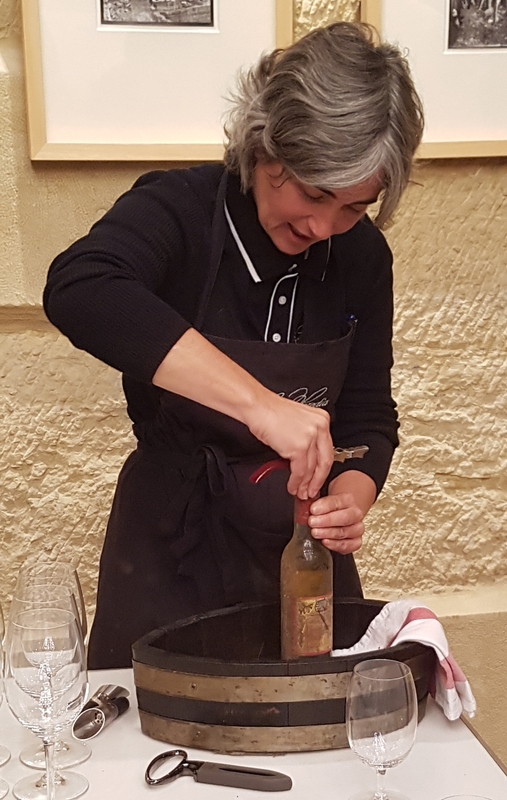 I decided to step into the mythical bodega and there stood María José López de Heredia opening a mysterious bottle. I didn’t know exactly what it was when she poured it. But indeed I understood that it was a white Tondonia and that I had stepped back in time. López de Heredia’s wines must be one of the most legendary in Spain, and well-known for being made the same way since the winery’s foundation 130 years ago. 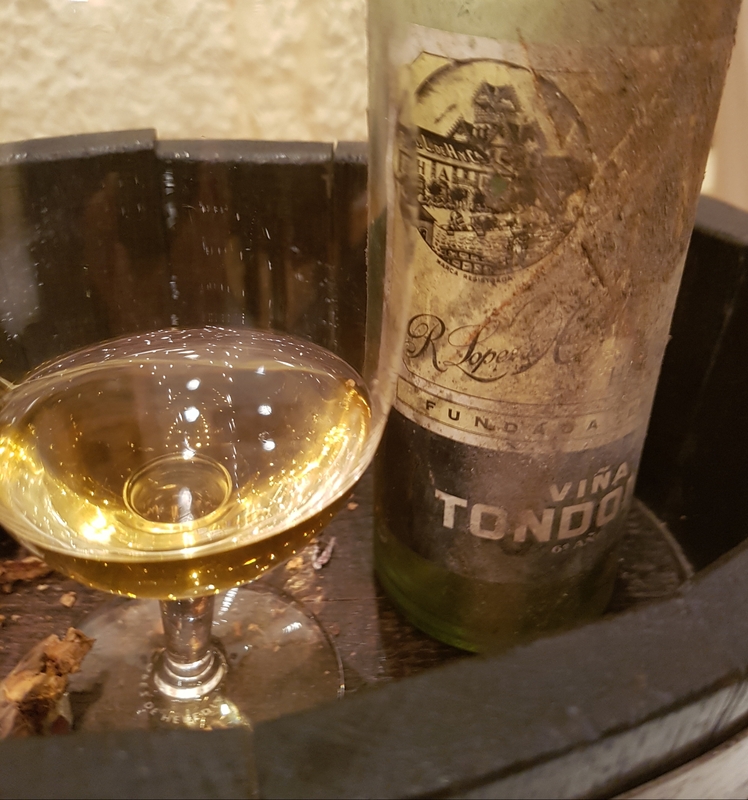 Only grapes from their own vineyards are used, for this wine one from their most emblematic Viña Tondonia, a 100 hectares pago not far from the bodega. The soil is clay with a high limestone content. It’s a large vineyard with varying plantings and grape varieties, but average age is around 50 years. The cultivation is organic. To get the fermentation going they simply wait. And if it looks like it’s going to be difficult one can only open the windows, as in Haro there are often big differences in night and day temperatures. The wine is made from 85% viura, 15% malvasía and has 12% alc. It stayed 6 months in wooden deposits, then 9 years in old barriques of American oak, treated in the bodega’s own cooperage. It was racked manually 18 times, then clarified with egg whites. It was then bottled from the barrels in July 1973 without filtering. Golden colour towards amber. Notes of dried fruits, toasted almonds, citrus and a touch of honey (without the sweetness, if that makes sense). It’s almost like walking in an old sherry bodega. Glyceric and rich, with a smooth texture. 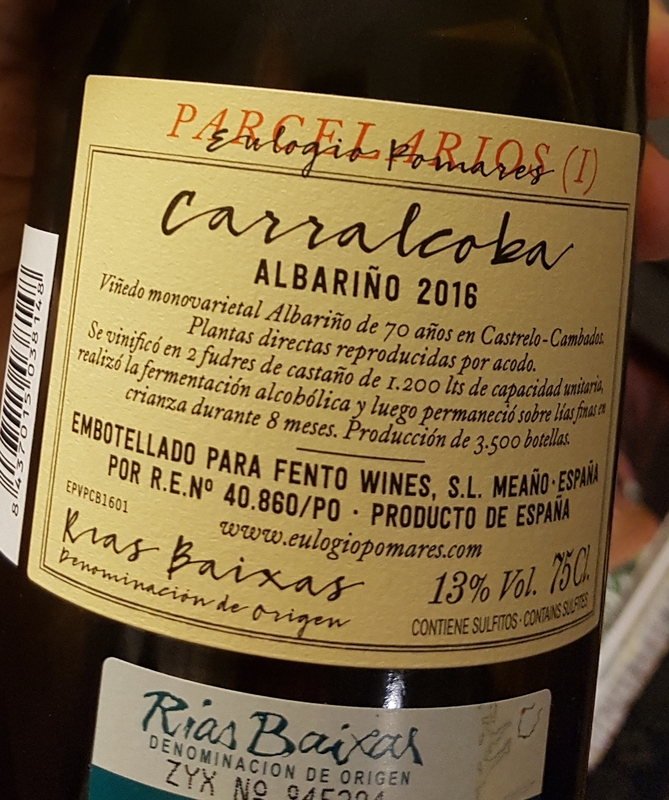 Low alcohol, high natural acidity, and a salty finish. But even if there are other barrel-aged whites this is almost in a category of its own. Eulogio Pomares has been the winemaker at Bodegas Zárate since the 2000 harvest. He has started to make some wines for himself too, in tiny quantities under the label Grandes Vinos Desiguales, and some are quite sensational. The soils are granitic, and the grapes for this wine come from parcels that Eulogio has replanted and using biodynamic principles and without rootstocks. 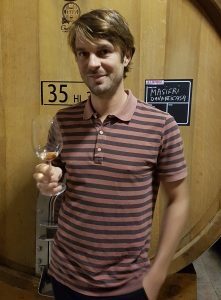 Only native yeasts are used, the wine stays in 1,200 litre chestnut foudres and stayed 8 months, where it also undergoes malo-lactic fermentation. 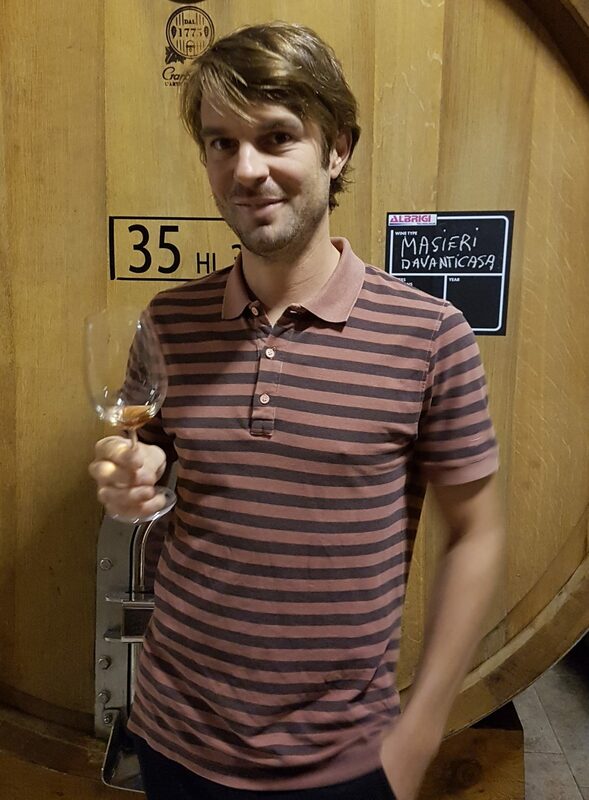 This one was fermented and aged in big 1200 liters vats of chestnut. The vines are seventy year old, and they are located in Castrelo-Cambados, in the central part of Salnés, probably the most important sub-region of DO Rías Baixas. 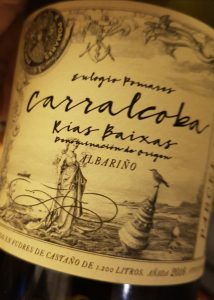 We have seen several styles of albariño over the years. Some of us are a bit tired of the commercial, aromatic versions. Too heavily oaked wines were plentiful at a time, and always out of question. Later there were many lees-aged wines; a good idea, but this too can make the wines more similar to each other. I like the ones on the wild side, made without corrections. Here is yet another interpretation, a chestnut and lees aged single vineyard wine from old vines. Straw yellow. 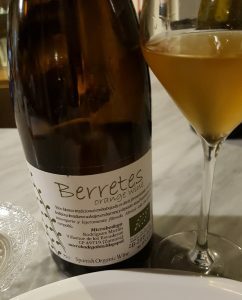 Apple, lemon, pear and white flowers on the nose. 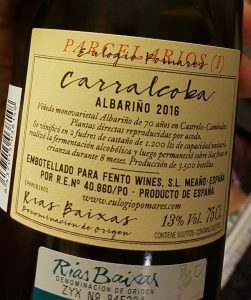 It has a fantastic concentration, is full, with a lemony acidity and with an extraordinary length. It has a touch of oxidative character, but it’s held in check, and is balanced incredibly. Close to perfection.